It’s always great when you find two products from the same brand that work perfectly together. You know what I mean, two products that work in harmony for example the Clarins Cleansing Milk and Toning Lotion… perfect combo. Well, today I have another two products from one of my favourite all time brands, that work great to give you a refreshed glow in the morning and throughout today. They have been on the market for quite a while now but I thought it was only right to share my experiences with you. Guys, its GinZing. 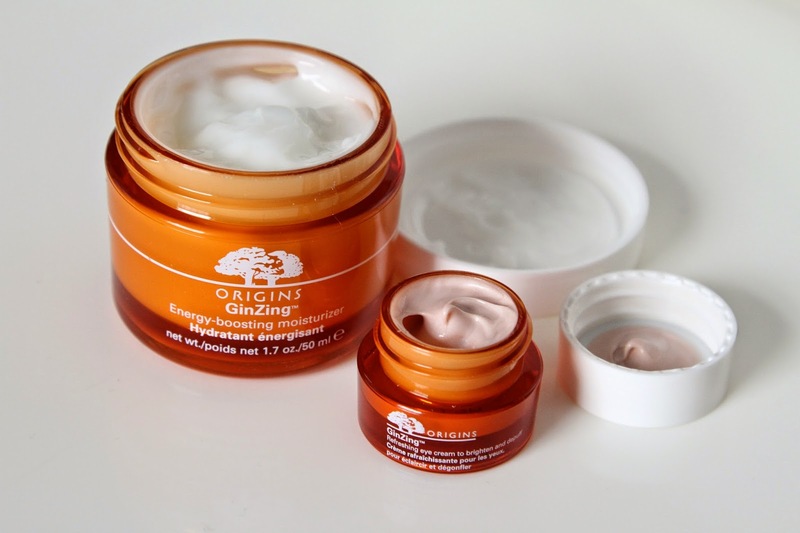 Now GinZing is a skincare range by Origins that boosts radiance and boosts natural glows. It’s basically a shot of espresso for the skin! You get my drift? And my two favourites out of the family are the award winning GinZing Refreshing Eye Cream and the Energy Boosting Moisturiser. Now I’m sure all of you have at least heard of the Refreshing Eye Cream, if not, where have you all been? Winning Company Magazine Best Eye Cream 2013 award, this cocktail of ingredients reduces the appearance of dark circles, puffiness and baggy eyes that most of us have especially after a night boozing in the town. We all have our hangover and monday morning skincare secrets and this is another one to add to your list! Containing caffeine, Panax Ginseng, Magnolia and natural optic openers, this eye cream rapidly wakes you up giving you a lively, glowing appearance, even if on the inside you’re still half asleep. The moisturiser has a very similar effect for the rest of the facial features. It takes away uneven skin tone by throwing hydration and radiance into the skin. It also too contains Caffeine and Panax Ginseng so as mentioned before it will give you that boost you need. These two products are great to fit into your skin care routine working as a perfect day eye cream and moisturiser. You can also apply them on an evening to help keep you looking fresh when you wake up, but I feel that using them on a morning is just enough! The GinZing collection also has face masks, cleansers, mascaras and SPF moisturisers so go take a look. Thanks for reading, have you used any GinZing products?